Twelve months on, Francesco Pizzo finally exorcised his demons. Last year, the Italian pre-race favourite had sped to an early lead in the Tour ta' Malta only to suffer a mechanical problem with his bike seat that saw him tumble down the rankings. Eventually, he got back to finish third overall, an impressive comeback but nowhere near good enough for someone who could already taste victory. That failure to win had been preying on his mind. "I've been thinking about the Tour ta' Malta and was determined to come back to win it," he confessed after this year's win. Pizzo did most of the hard work on the opening day's time-trial, when he opened a three-minute lead over the rest of the field. It would prove to be enough. He said: "It was important to get a good result in the time-trial. From then on, it was simply a question of keeping the rest in check. If I could go on and win one of the other two stages then all the better but it wasn't vital. The important thing was to ensure that no one opened up a big enough lead ahead of me." As it was, Francesco Guccione went on to win the final stage of the Tour ta' Malta in Gozo on Saturday, after breaking from the peloton with Pizzo shadowing him in third in what was, strategically, a perfectly-executed plan. Indeed, with no team-mates to help him out, the time-trial was the only leg of the Tour ta' Malta during which he could really attack. "It was very hard," Pizzo admitted. "All the other main riders had good teams to back them up which, in cycling is a massive advantage." With the overall result determined, attention then focused on the Maltese riders to see who would come first from the local competitors. David Galea held an overnight lead of 19 seconds over Maurice Formosa before the Xagħra leg but the tables turned on the final day. "It is a huge satisfaction," was Formosa's immediate reaction. "I didn't believe I could do it especially after the time-trial when I didn't do so well. However, I did much better than expected in the second race despite the fact that there are a lot of climbs in the San Martin route which, traditionally, aren't my forte." Asked about the pressure of going into the final race in the lead, the Melita Pedal Power Club rider admitted that there was little rivalry in races like this. "Apart from being my cousin, David is a good friend of mine particularly on the Tour when our aim is to ensure the best possible results from Maltese riders," Formosa said. 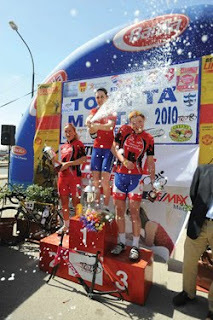 There were no surprises among the women where Iona Sewell won the Tour despite finishing third in Gozo. "I had a bad start," the taciturn Squadra Donne rider said. "But I knew that I had a good lead and for me it was just a case of ensuring that no one really got away." Had that happened, it would have been something of a travesty as the Briton had dominated the Tour up till that point, building a lead of over three minutes ahead of her nearest rival. For her, there was also the added satisfaction of overcoming Claudia Koster, one of the two cyclists who had finished ahead of her last year when she came third. Among the Maltese, Marie Claire Aquilina (Greens Cycling Club) came first. "There were some very good cyclists here," she said, before intimating that she had hoped to do a bit better. "Hopefully, this will help me improve for the National Championships and then next year for the GSSE in Liechtenstein." Overall, this was another impeccably organised Tour that was rounded off with a traditional friendly ride that ended in Sliema yesterday. "I don't think we've ever had a Tour as well organised as this one," race director and president of the Malta Cycling Federation John Zammit said. "All merit goes to the large number of volunteers and helpers who made this possible. "From a cycling point of view, we had some very strong teams here and have witnessed three days of high-class competition. At the end of the day, that is what motivates us to organise the Tour." Away from the competitive aspect, there was also a more poignant side of the 2010 Tour that was dedicated to Cliff Micallef, the avid cyclist and former association secretary who lost his life in a traffic accident last year. "We put flowers on his gravestone before the start of the Tour and I have to admit that for an hour or so I didn't really know where I was," Zammit said. "All I could think of was the work and effort he had put into Maltese cycling, everywhere I looked I saw memories of him." This article appeared on the Times of Malta of the 22nd of March 2010.